One of the girls' favorite pastimes this Spring has been "water painting." 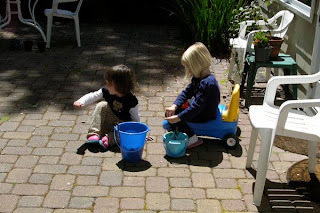 Yes, they get water in a pail, and a brush, and they paint the patio pavers or the patio furniture. When they tire of that, they may water the potted plants or make a "stew" by gathering sticks and leaves into their buckets of water.